This collection contains an amazing amount of information about the eating habits of various creatures. These habits are sometimes gross, sometimes cool, and almost always funny. The full-color illustrations bear the mark of an award-winning cartoonist. As readers enjoy the poems and illustrations, they will also learn about the food chain and the web of life. They will learn how beetles do the dirty work of cleaning up animals on the roadside, how wasps hatch inside unsuspecting caterpillars and eat their way out. They will enjoy the surprise of a mole that tries to eat a banana slug but quickly spits out the awful tasting creature. They’ll observe a delicate dragonfly eating on the wing, and watch a cobra giving a rat a big hug. With fascination, readers will follow the feeding that goes in both inside and outside the sloth. This book certainly will keep children turning the pages. 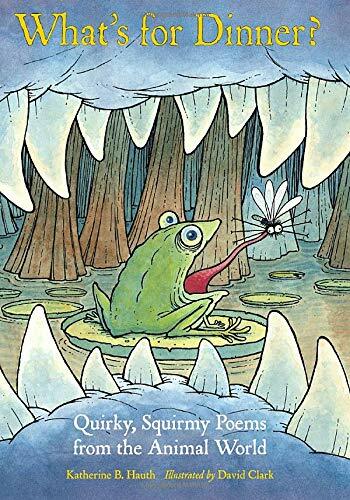 Not only will they relate to the poetry and humor, readers will revel in the unusual details of animal eating habits. A very enjoyable read. Highly recommended. Phyllis J. Perry is the author of over 70 books for children, most recently Panda’s Earthquake Escape (Sylvan Dell), and a frequent reviewer of children’s books.